Opaque yellow color with a thin white head. The smell has pretty sharp hop aroma, the taste has a citrusy resin flavor. The feel is smooth, creamy and finishes dry. Overall it’s a very good beer. Great double IPA. I thought the color wasn’t quite bright enough but the flavor and the mouth feel were fantastic. As good as any double IPA I’ve had. Pours an opaque pure, glossy gold with a big, frothy white head; decent retention results in layers of thin, stingy lacing and subtle yet thick collar of foam. Aromas of sweet peach and an overwhelming soft, creamy tropical medley dominate upfront, with bits of dried grass and grape must, hop spice, and pine resin all adding a unique, subtle earthy influence to the bouquet; tons going on here, and it’s all soft and balanced. Taste profile offers up a tropical medley (guava, melon, etc.) meshed with earthy hops and bits of pine resin; some doughy malts round things out and present some balance alongside the growing herbal hops on the finish. Mouthfeel shows a medium body with a very balanced but slightly active carbonation and zero alcohol presence. Juicy at a high level, and works excellently alongside a solid dose of bitterness that proceeds through the mid-palate to the finish; can feel a bit dense at times, but I’m really liking that’s how it throws its weight around. Awesome balance of a varied earthy, tropical profile on a foundation of juicy, hoppy bitterness. Soft but never quite dull on the palate; this one is at top-tier drinkability. Cloudy and nearly orange in the glass. Really tasty, fruity citrus. 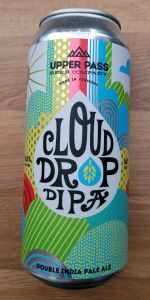 Excellent beer from what may be a gypsy brewer, since Cloud Drop is brewed at Von Trapp. Poured from a 16 oz can into a tulip glass. Pours a hazy deep orange color with a finger of off-white head. The head leaves a ring of lacing as it settles into a thin sheet. The aroma brings notes of grapefruit, orange rind, cantaloupe, and sweet malt. The flavor is a citrus bomb. Grapefruit, orange, lime zest, and tangerines lead the way. There's some peach notes and a hint of honeydew melon with a solid malt backbone. The feel is medium bodied with moderate carbonation. Very smooth and creamy with a dry finish. Alcohol is very well hidden. Overall, a great albeit slightly over hyped DIPA. It's a nice balance between the sweet, tropical NEIPA style and the bitter West Coast IPA's. There's a solid malt presence with a great mouthfeel. Would definitely try this one again. Poured from a 16 oz can into Fiddlehead tulip. Pours a hazy orange; light lacing that clings and retains on the glass. Mouthfeel is super-creamy. Nose is not very noticeable. Taste is citrus, sweet pineapple, mango. Alcohol is well hidden and combined with the easy drinkability, I would not be surprised if drinking 3 of these would not be hard. Not as hoppy as HT or Focal, but much smoother and easier to enjoy with non hop-heads.